NES Little Red Hood in 05:34.17 by Dimon12321. This unlicensed game is based very loosely on the story of Little Red Riding Hood. 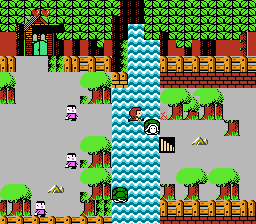 The protagonist must kick trees and stones to get fruit and treasures in order to progress through 10 rounds, all while avoiding enemies such as bears, cobras, goblins, and hedgehogs. In this run, Dimon12321 quickly guides Little Red Hood to her grandmother's forest clearing--there's no house to be seen--by manipulating movement and positioning of enemies, items, and the ladders that allow progression from one round to the next.